Acer on Wednesday announced its Aspire Ethos laptops, which incorporate a secondary touch screen that doubles as a touchpad to help navigate multimedia content. The extra touch screen, placed below the keyboard where a touchpad would normally sit, can display icons that make it easier for users to navigate through movies or music, said Alison Williams, an Acer spokeswoman. The screen will also allow users to do things like adjust the volume or sort through images. "The media console is now combined with the touchpad, providing a set of commands all managed by a single key and a completely new approach to entertainment control," Acer said in a statement. The improvements help maintain a clean surface and elegant design, the company said. Efforts are under way at several companies to snazz up touchpads, also called trackpads. Synaptics is adding gesture functionality to let users quickly perform routine PC tasks. Intel has also suggested that touchpads can be replaced with auxiliary screens displaying widgets to perform quick tasks like typing Twitter messages. The Ethos laptops run on Intel's latest Core i5 and Core i7 processors and include an Advanced Micro Devices ATI Mobility Radeon HD 5000 series graphics card, allowing playback of full high-definition DVDs. 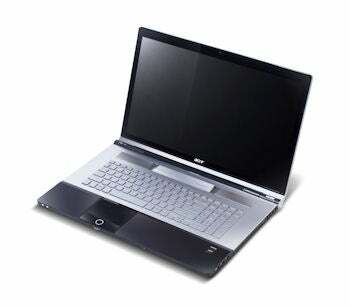 The laptops can also be bought with Blu-ray Disc drives. Acer included its Arcade Deluxe software for managing multimedia, which it says will help take better advantage of the touchpad controls. It is supposed to make it easy to manage high-definition videos, photos and music, and to share content through sites like YouTube, Facebook and Flickr. The Ethos 8943G comes with an 18.4-inch screen, while the 5943G comes with a 15.6-inch screen. The laptops will provide up to 1.28TB of storage through two 640GB hard drives. Wireless options include Wi-Fi and Bluetooth. The pricing was not immediately available.